Bennington Township - An open house will be held at the new Bennington Township Hall on March 1, from 2-5 P.M. The new 40 by 75 foot building is located on a three-acre parcel on the east side of M-52, between Garrison and Brewer roads, south of Owosso. Bennington Township supervisor Philip Kline, clerk Ray Wirth Jr., Treasurer Geraldine Stanton, and trustees Harold Kellogg and Richard Sayles, will act as hosts for the event, to which all Township residents, the public and interested area public officials have been invited. The $155,000 building was recently completed on a plot of ground that had been owned by the Township for the past 15 or more years. According to Kline, funds for the building were derived from interest realized on the investment of Township funds over the past eight years, thereby "not costing Bennington Township residents one cent of tax money." The building, which includes a complete kitchen and two restrooms, features a large main room which measures 40 by 45 feet and which can be divided into two sections by movable partitions. There is also a 12-by-15 foot office, which includes a 6-by-12 foot fireproof vault, a 12-by-20 foot garage and a utility room. Kline and Sayles noted that the paved and lighted parking lots on both sides of the building have spaces for nearly 150 vehicles. Tables and chairs are available to accommodate 120 people, they added. Heated by an oil furnace, the building also has a complete air conditioning system, Kline said. A deep, five-inch well provides an adequate water supply, he added, and there is a large septic tank system. 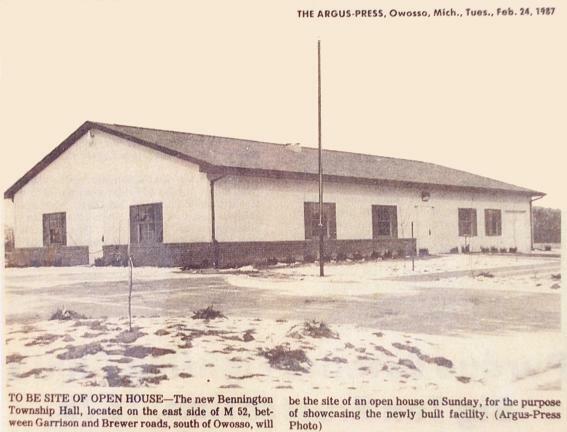 The building was built by Mid-Michigan Construction Corp. of Owosso; Kline said most of the work, particularly the plumbing and heating, was done by the Bennington Township residents. The insulated building, with brick trim is nearly completely carpeted. The board plans to accept bids on the old 26-by-60 foot Township Hall located at the corner of M-52 and Grand River Road at "Pittsburgh corners." Built many years ago, the structure sits on a plot of ground which "roughly" extends only about four feet from the sides of the building, Sayles noted.